Last month for Shmoocon I decided I wanted to expand my skills a bit and take a shot at something I hadn’t really done much of in my InfoSec career lately, not since way back in the WEP and Linux Zaurus technology years. Wireless hacking, i.e. a Wireless Capture The Flag event. I’ve done some appsec testing, network pen testing, and similar in the past, but more side of desk to my core roles. I haven’t played much in the wireless world, even after getting my Technicians class radio license last year (also at Shmoocon, baby steps I guess), so made the choice to learn as much as I could in my few days at the conference from their WCTF event put on by the good folks at Wireless Village. These pages will describe what I’ve learned. Order is hardware discussion then software discussion. There will be references to some of the software tools in the hardware section, but don’t fear, all will be made clear in the end if you were like me and new to the subject. Any software/terms mentioned early on aren’t critical, just for future reference as you manage to read through this page. To start I needed a laptop. I have my personal Macbook Pro 13″ and an old Dell Vostro, but I didn’t want to deal with the silliness that MacOS presents to non-Mac’y things, and the Vostro is an ancient heavy 15″ stuck in the 32bit world. I wanted something reasonably small, good battery life, great high-res screen and both USB-C and USB 3.0 ports to support a wide range of addons (like the wireless card I’ll talk about later). I was targetting something that could handle four threads with no problem and at least have 16GB of ram and 256GB of SSD storage. Also, needed to fully support Linux, and for well under $1K since I already had a perfectly fine daily laptop in the Macbook Pro. The above quickly relegated me to the refurbished or used world. Doing some searches I eventually found the Dell Latitude 7370 series. This met all my requirements: ~2.5lbs weight, Intel M7 CPU, 16GB Ram, 256GB of Storage, QHD+ 3200×1800 13.3″ Touch Screen, WiFi AC, BT, USB-C and USB 3.0 ports. And reports from the web said Linux installed fine on it. Final key point, you can find these laptops (depending on exact spec) ranging from $500-800 refurbished, and often with a 3 year Dell hardware warranty included. I managed to get mine on-sale at Newegg.com for a hair over $700 fully loaded about a week before Shmoocon. 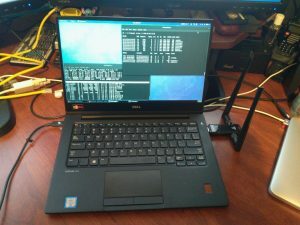 Though the laptop came with Windows 10 Pro installed, I shrank the partition down and installed a dual boot with Fedora 27 (here is a straight forward write up). I did a UEFI install of Fedora so that I could leave EFI Secure Boot enabled. That caused some headaches (I mean learning opportunities) later when I was dealing with kernel modules for my new USB wireless card, but my goal was not to compromise host os security if at all possible. I have kept the dnf security update process intact, I run SELinux enforcing, secure boot enforcing, encrypted partitions, and firewall, at all times. Though there is always some level of “trust” that must be placed in Open Source software providers, I also make sure my dnf system has current keys and verifies software signatures regardless of providers. So far there are only three software components that aren’t handled via dnf, which I’ll go into later. I also made sure to create a new user and make them an “Administrator”, which is separate from the all powerful root user. Hardware wise, almost everything works, and everything I needed did. The only items I have not gotten to work in Linux is the fingerprint scanner, the WWAN, and the ID card reader. And really, I just haven’t tried, maybe in Part 3? There were only tow key changes I made to the standard Fedora install to make the hardware more effective. I was able to add additional choices, and found that 175% was the perfect scale for my vision. Second was to add a gnome shell extension called “Block Caribou”. This shell extension stops the virtual keyboard from popping up on the screen if you happen to use the touch screen. Between accidently tapping the screen, and just trying it out, I don’t need another keyboard popping up and getting in the way of doing work. Easier to keep it off using the shell extension. You should be able to find it in the Fedora software shop under “add-ons -> shell extension”. Ctrl-F to search for Caribou. Make sure you have the latest source/headers for your kernel and build tools so you can build your kernel module against it. openssl req -new -x509 -newkey rsa:2048 -keyout MOKmycert.priv -outform DER -out MOKmycert.der -nodes -days 36500 -subj "/CN=mycert/"
On reboot the system should automatically detect the key addition request above and boot into the MOK key management system. Here you will be requested to provide passwords and accept the addition of your key. Unfortunately this may vary some depending on bios version and hardware so I can’t provide a lot of guidance here, just read carefully and follow the prompts. Also, REMEMBER YOUR PASSWORDS! Now when you finish rebooting your signed kernel driver for your Alfa should load fine. The uname -r will insert the current kernel into the command, if you updated your kernel but hadn’t rebooted yet, it will be the wrong kernel version as you are still running the old kernel. You’ll need to manually figure out the kernel path. You could script all the above into one command to make it easier to do on each new kernel upgrade. This part I fully figured out on the last day of Shmoocon, unfortunately it really messed up my WPA hacking and I didn’t realize it until it was to late to fully recover before the end of the WCTF. If you don’t do this you will be able to slowly crack WEP, and you’ll see things on WPA, but none of the techniques will work. It will look like it’s working, but it really isn’t. NetworkManager (which manages all your network connections) will constantly mess around with your monitor and packet injections even when it looks like it’s not. Took some digging and testing, but finally found a nice way to get NetworkManager out of the way. Now NetworkManager should stay out of the way and allow you to have fun. I based the software I installed on the Pentoo Linux security focused distribution. You could go the route of just installing Pentoo or Kali, and that’s fine, but I wanted a more general purpose setup. I also wanted to make sure I was familiar with the small details that go into installing, using, and maintaining the software stack.